For the first time ever you can get a deck containing 104 cards that matches perfectly a professionally produced card deck. This allows new effects never possible before. Because a spectator will never expect that underneath the first 52 cards (54 with Jokers) is waiting another complete deck of playing cards. The cards of the Double-Decker are so ultrathin that two complete decks incl. Jokers fit into a regular cardcase! Design, playing card size and corner roundings exactly match the regular Phoenix Deck. 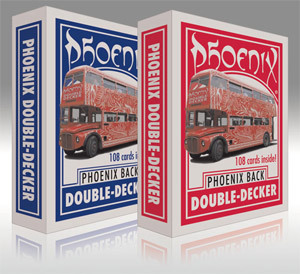 Cardcase of the Double-Decker is produced at US Playing Card Company to match the cardcase of the regular Phoenix Deck and allows an easy deckswitch. The backs are marked like the Phoenix Marked Deck and therefore allows additional handlings. Roughing the cards will add a little thickness to the cards, but still 104 cards fit into the cardcase. Glueing cards in pairs is also possible, the added thickness does not prevent to still put the two full decks into the cardcase. William asks: Can you request a particular force card? 1. Vanishing Inc. Magic responds: Sadly not. The decks are randomly allocated. Sorry. Mark asks: Do they come pre-roughed or do you have to do it yourself? 1. Vanishing Inc. Magic responds: Double Deckers do not come roughed.